I’m not sure of the origin, “You can’t get blood out of a turnip.” Some sources seem to believe that the phrase originates from the Bible myth of Cain and Abel when Cain is punished for giving the deity sacrifice in the form of crops but Abel gives in the form of meat or shedding the blood of an animal. Charles Dickens wrote in his novel David Copperfield “Blood cannot be obtained from a stone.” There are similar phrases using a stone instead of a turnip. In either case, the meaning of the phrase usually refers to a stingy individual who refuses to give money, time or kindness to a particular cause or person. Turnip greens are a common food in the south and usually cooked in pork fat. The greens are high in vitamin K which is known as “the clotting vitamin” and is not recommended for people who take blood thinners. The turnip itself is starchy and has somewhat of a peppery taste. It has a much thicker skin than a potato. Turnips are difficult to cut with a knife and boiling them takes a long time. The whole plant is nutritious and can provide significant calories. The resilient turnip can be found almost anywhere up and down the east coast. I have been travelling back and forth from western North Carolina to Pennsylvania for the past few weeks and see the little yellow heads of turnips all along the way. I even saw a turnip coming up in the middle of parking lot coming up between broken pieces of pavement. Because turnips are so common, during the Middle Ages turnips were associated with poorer classes. Peasants were the only people who would dig in the ground for food which also included garlic, leeks, onions and shallots. Knights and clerics would have been viewed as desperate to dig for a turnip. A fourteenth century German proverb exemplified the belief in the saying, “Let the lowborn dig turnips.” More contempt for the poor exists can be found in the Medieval Latin proverb, “Why do you seize another’s property? Can’t you feed yourself on turnips?” This ideology would be equivalent to asking poor Americans why they can’t just grow their own food and be content without government assistance for food. I do not like to waste money. I could fairly easily spend much more on items than I do, but I like the challenge of not paying retail prices for anything and buying as few things as possible. The primary reason why I enjoy growing my own food and having chickens is not for the health benefits of good quality food and exercise but for how much money is saved and the joy of not participating in the typical consumerist economy. When I ate primarily from food grown by me I did not have to take medications for heartburn and saved around $30 per month by not buying medication. For the past couple of months, I have strayed from my frugal past and down the road of eating more frequently at restaurants and buying food from grocery stores. The results have been devastating because I have been forced to resume my medications that I did not have to use for two years and physically I have gained weight. I’ve also caught three colds from eating out so frequently. From a psychological standpoint, I have become unhappier because I’m not experiencing the pride from eating food I have grown. Saving money is part of my identity, and I do not waste my own money or other people’s money because life is more enjoyable when I simplify wants. There is a concept of pleasure versus happiness in Buddhism or for a more “American” perspective consumerism versus happiness. I’m happier when I feel more self-reliant by not relying on large corporations to dictate what I should or should not want. Below is a chart which includes two trips to grocery stores one is to a “normal grocery store” and one to a discount grocery store. The discount store has food that may be close to expiring or foods that have been mislabeled. My boyfriend is moving into a new house and needed food for his move so I bought him food I thought he would like. He typically doesn’t eat meat or dairy products. This is an old post from a previous blog. My mother recently traveled to Israel and many of the places had associations with Mary Mother of Jesus. Mary was a much more important figure from the Muslim perspective. 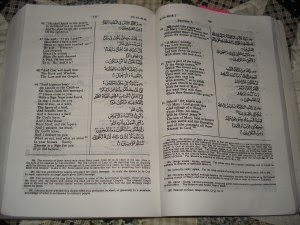 Recently my brother gave me a copy of the Koran. I have been reading through it and find certain passages very interesting. I have read several Suras online, but it is nice to have the actual book. As you can see from the picture, the left side is in English and the right is Arabic. It is nice that there are so many notations at the bottom of the page which gives explanations of the passages. It has to be read by starting from the back and then flipping forward which is a little confusing. I think the words in parentheses are added for clarification from the original translation because the KJV does the same. The Koran talks about the childhood of Jesus and the story of his miraculous birth. Mary’s supernatural birth is mentioned, too, in Sura III. The text doesn’t specifically say what Mary’s mother’s name was, but in the note section it says by tradition her name was Hannah. At least in the Koran there is a miraculous birth of a female child. I can’t recall a single female child born that was considered a blessing within the Bible. It then goes on to say that Mary lived with Zakariya. We know him by the name, Zacharias, the father of John the Baptist. Notes Section: Mary the mother of Jesus was unique, in that she gave birth to a son by a special miracle, without the intervention of the customary physical means. This of course does not mean that she was more than human, any more than that her son was more than human. She had as much need to pray to God as anyone else. The Christian dogma, in all sects except the Unitarian, holds that Jesus was God and the son of God. The worship of Mary became the practice in the Roman Catholic Church, which calls Mary the Mother of God. This seems to have been endorsed by the Council of Ephesus in 431, in the century before Muhammad was born to sweep away the corruptions of the Church of Christ. 42. Behold! The angels said: “O Mary! God hath chosen thee and purified thee – chosen thee above all women of all nations. 44. This is part of the tidings of the things unseen, which we reveal unto thee (O Apostle!) by inspiration: Thou wast not with them when they cast lots with arrows, as to which of them should be charged with the care of Mary: Nor wast though with them when they disputed (the point). 47. She said: “O my Lord! How shall I have a son when no man hath touched me?” He said: “Even so: God createth what He willeth: When He hath decreed a Plan, He but saith to it “Be,” and it is! Later in Notes: The Muslims are the true Christians, for they follow (or should follow the true teaching of Christ, which did not include the blasphemy that he was God or the Son of God in the literal sense. But there is a large body of men, who by birth inherit such teaching nominally, but their hearts do not consent to it. Their real Muslim virtues (which from their point of view they call Christian virtues) entitle them to be called Christians, and to receive the leading position which they at present occupy in the world of men.